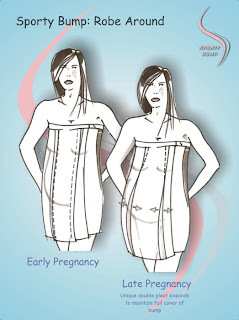 I was given the great opportunity to try out a 'Sporty Bump Robe-Around' - a wrap-around pleated towelling robe aimed at pregnant ladies and new mums to be. 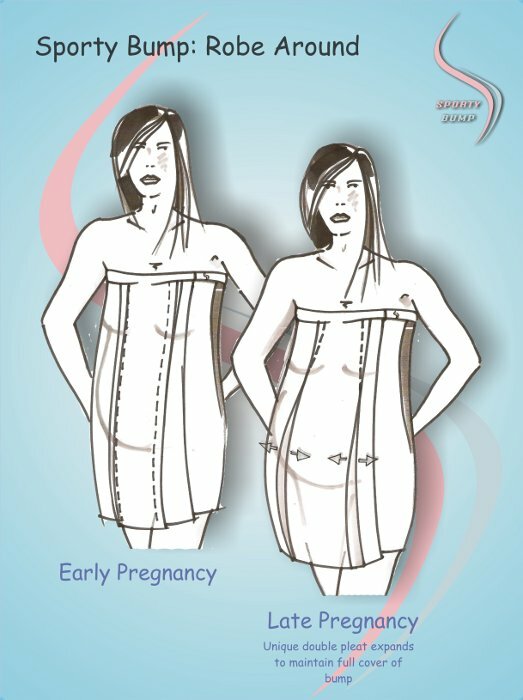 Created to give complete privacy during pregnancy. Ideal in public places such as the swimming baths, gym, tanning rooms or health club. The trial of Robe-Around couldn't have been timed better as Isla has started swimming lessons and we now head to the pool on a weekly basis. As my bump has grown, the more I've come to appreciate the roominess of the design! The central theme of Sporty Bump products is that they recognise that us pregnant women have needs and we want to look and feel good even as our body shape changes. This particular product is excellent in that it has pleats built in so that as your bump grows it still covers your modesty! There is also no chance of the towel falling down on you in the changing rooms due to the nifty velcro fastening at the top! This is also not a product thats use ends when pregnancy is over. We all take varying amounts of time to get our bodies back in to shape after having a baby so the towel still works to keep our body under wraps! Personally I have found it to be my towel of choice now for swimming. The fact that it stays secure and grows with my body is brilliant. I'm not shy about my pregnant body at all but I think that the concept is great for women of all shapes and sizes who may not feel so confident in a changing room environment. Getting changed with a toddler can take time, they wander off all over the place and so without the velcro fastening I'd be forever tucking in a towel as it would inevitably fall down all the time. The length of the fastening is also quite long meaning that the towel is one size and will fit even the biggest of bumps! It would also be perfect as a holiday cover-up for the pool or beach. One size fits all and it comes in black. It can be purchased from http://www.sportybump.co.uk/ and it retails at £20 plus p&p. You can keep in touch with Sporty Bump on twitter http://twitter.com/SportyBump) and Facebook. I was sent a sample 'Robe-Around' for the purposes of this review and did not receive any other financial reward for the post. forget being pregnant, I want that for when I take all 3 swimming on my own! My towel *always* falls down as I am trying to dress Pixie, chase after Monty whilst sorting out Max's hair (you get my drift, Octopus mum).